They may be seen in marshlands, mudflats and fields near the water. It's best to shoot them (with a camera) when they stand still. Because, they move real fast, then stop, when they search for food. Worms, spiders, molluscs and crustaceans are their main diet. During mating season, they spruce it up a bit and go for berries, seeds or, leaves. When they have eggs in the nest, both parents set on them until they hatch. If a predator comes along, one of the birds will distract it. They hop around, making believe they have a broken wing to get you away from the chicks or, eggs. To imitate the sound these birds make say, "Kyu-Week" real loud. 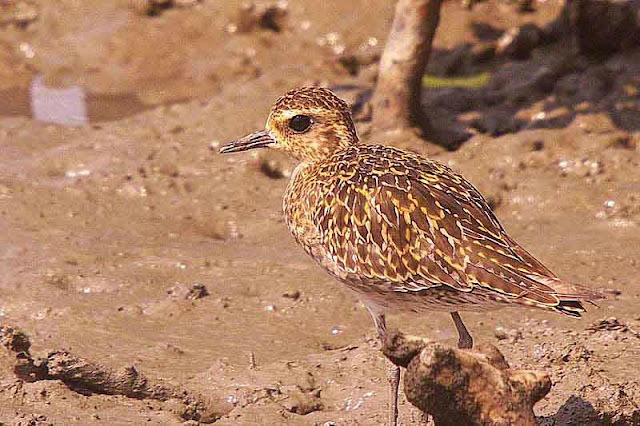 Pacific Golden Plovers breed in the tundra. So, don't expect me to show you any photos of them doing that !